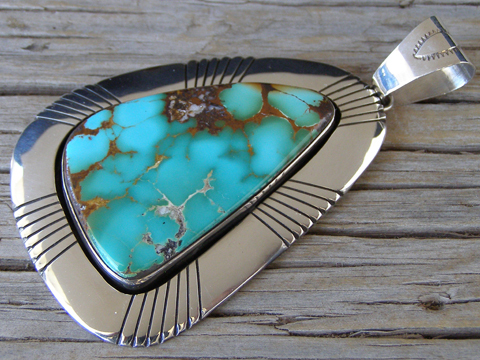 This large pendant is set with a superb specimen of natural, untreated Royston turquoise from Nevada. The stone is set in a smooth bezel within a shadowbox formed by a beveled border marked by bands of stylized eagle feathers. This exquisitely fine-grained turquoise is polished to a lustrously smooth finish. Match this with a fine strand of handmade Sterling beads (see below). Stone: 2" x 1 3/16"
Dimensions of pendant (excluding jump ring & bale: 2 11/16" x 2"
Total hang (including bale): 3 1/2"